If Rory McIlroy is intimidated by the importance of this week, he certainly isn’t acting like it. The PGA Championship starts on Thursday, and as the final major of the year, it’s the 28-year-old golf superstar’s last chance to redeem what has been a lost year. McIlroy hasn’t hoisted a trophy anywhere in nearly 11 months, and it’s now been three years since his last major title. While there are certain mitigating circumstances surrounding his mediocre season — an early-season rib injury has limited McIlroy to just 12 worldwide starts, and he’s found the top 10 in half of them — victories are the only true measure of success for a player as accomplished as he is. McIlroy won four major titles between 2011 and 2014, including a pair of PGA Championships, but his count has stalled since then. To make matters worse, Jordan Spieth has taken three majors of his own since the calendar turned to 2015, causing the Northern Irishman’s pace to appear sluggish by comparison. All of this has led many fans and experts to label this week as a massive one for McIlroy. Spieth has taken up the mantle of the game’s most exciting young gun, but if McIlroy can finally put it all together and deliver a vintage putting performance, it would go a long way towards reasserting his dominance. But oddly enough, McIlroy appears to be treating this week more like a Waste Management Phoenix Open than a final chance to add to his major tally before next spring. It seems like he’s been all over Quail Hollow Club, delighting fans with antics such as hitting drives in a spacesuit and signing a baby. McIlroy’s desire has been called into question in the past, but he’s generally not one to lose focus during a major week. 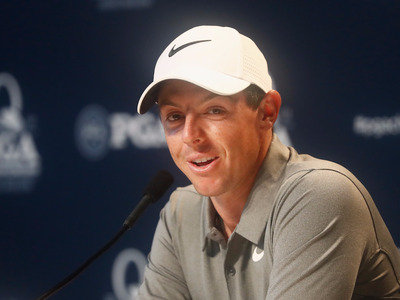 Instead, there may be a different reason for McIlroy’s relaxed attitude: confidence. With back-to-back top-five finishes at the British Open and WGC-Bridgestone Invitational, McIlroy is playing his best golf of the year. His driving is, as usual, off the charts, and he looked particularly strong with his wedges last week at Firestone. The results have been noticeable: he’s broken 70 in each of his last seven rounds. Furthermore, this week’s event will be something of a home game for McIlroy, as Quail Hollow is an important part of his legacy. It was the site of his first PGA Tour victory in 2010, as well as another win five seasons later and four other top 10s over the years. The course has undergone some changes since it last saw competition, but should still set up nicely for long hitters. One of the best drivers in the history of the game, McIlroy has plenty of reason to believe that his time to return to the winner’s circle has finally come. Of course, we won’t know for sure until Sunday, but he sounded at ease during his pre-tournament press conference. McIlroy is grouped with Jon Rahm and Rickie Fowler for the first two rounds. Their week will begin at 1:35 p.m. on Thursday.